Her beautiful setting in Trout Lake lit her up when she decided to move there 2 summers ago. Then the winters came along with the large mounds of slow to melt snow. Maneuvering the slick packed ice from the car to the front door and back was a daily act of agility and concern. And then there was the isolation. When we talked for the first time on Tuesday she had clearly had enough. She was moving to the Big Island. In a few days. I drove to her place Wednesday morning. I should have worn my snow boots. She said she is 72, but I didn’t believe her. Her spirit was vibrant, her humor easy, her openness charming. She showed me around. You learn a great deal about someone by entering their home. Collections of classic books abounded. Along with a vintage library table and unique bookcase. There was an old smoking cabinet with the original ornate key. A Bolivian painting displayed in a stunning carved wood frame. Old hammered metal pitchers and bowls. A cherry tea cart. 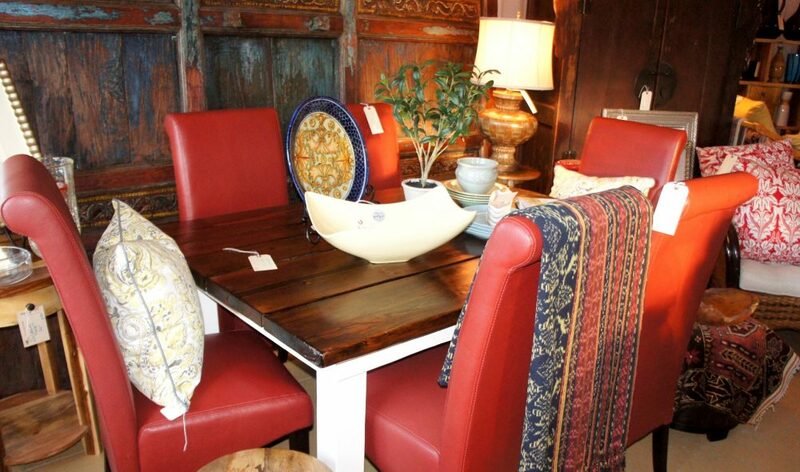 Antique tables, chairs and hutches. A hand painted Japanese screen signed by the artist. A custom Black Bear quilt and shams. Imagine a 1930’s pounded metal light fixture from a South Dakota saloon. And then, her mesmerizing collection of rose quartz, mahogany obsidian, and petrified wood. We’re in search of someone who loves working with stained glass because there is an old metal 4 drawer file cabinet filled with glass and tools of the trade. After inventorying her treasures, we had a truck and two men at her place and everything delivered to The Dwelling Station by 4pm that day. She was now dreaming of Hawaii instead of wondering what to do with her life’s collection of memories. It felt wonderful to be there and help her. But that’s only part of the story. She had called about 10 days prior and left a message. It was my re-opening weekend. The shop was so alive with people and movement I completely forgot to call her back. When I finally did she was overwhelmed, distressed and frustrated with the ‘dealers’ she sought out to help her. I was willing to do whatever it took to make it right for her. And she was gracious enough to allow me a second chance. We all deserve a second chance. Thank you dear woman for inviting me over and greeting me with kindness. You are truly delightful. I appreciate your trust in me to find good homes for all those treasures that tell the story of your soul and life travels. You can view pictures of the latest arrivals at https://thedwellingstation.com/find-cool-stuff/. This entry was posted in stories from the station and tagged stories from the station by The Dwelling Station. Bookmark the permalink.